October 12, 2016 – On October 5, 2016, Blue Origin conducted an in-flight test of its New Shepard escape system, designed to bring the crew safely back to Earth if the rocket booster ever experiences a problem during launch. The New Shepard space vehicle is comprised of two elements -— a crew capsule in which astronauts can ride, and a rocket booster powered by a single American-made BE-3 liquid hydrogen, liquid oxygen engine. At liftoff, the BE-3 delivers 110,000 pounds of thrust. The New Shepard escape motor is mounted underneath the capsule. On a normal mission, the escape motor isn’t used and can be flown again and again. If a problem is detected with the booster, though, the escape system can quickly propel the crew capsule to safety. Prior to last Wednesday’s test, Blue Origin CEO Jeff Bezos said that the goal was to test crew escape at the most stressing flight condition: maximum dynamic pressure through transonic velocities. At the point of escape, the capsule escape motor would slam the booster with 70,000 pounds of off-axis force delivered by searing hot exhaust. The aerodynamic shape of the vehicle would quickly change from leading with the capsule to leading with the ring fin, and it would all happen at maximum dynamic pressure. Bezos said the test was likely to destroy the booster, since the booster was never designed to survive an in-flight escape, and it was unclear how the escape system would perform. Forty-five seconds after liftoff, at about 16,053 feet (4,893 meters), controllers commanded the escape sequence. The capsule separated from the booster and the escape motor fired, quickly pushing the capsule away from the booster. In less than two seconds, the capsule was hundreds of feet away from the booster. It reached an apogee of 23,269 feet (7,092 meters), before descending under parachutes and landing gently on the desert floor. 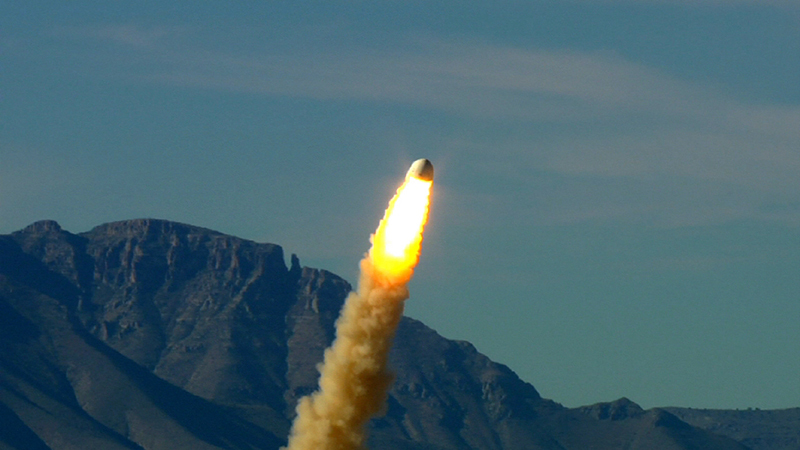 Remarkably, the booster continued its ascent, reaching an apogee of 307,458 feet (93,713 meters) and roughly seven and a half minutes after launch, the booster executed a controlled, vertical landing back at the West Texas Launch site. Blue Origin’s escape test used a reusable New Shepard booster that had already flown into space four times — the same New Shepard booster that last November became the first ever rocket booster to fly above the Karman line into space and then land vertically back on Earth. Both the booster and the capsule will now be retired and put on display. In the coming months, engineers at Blue Origin will do an exhaustive evaluation of the test data. The in-flight escape test is part of a series of methodical flight tests designed to ensure that critical safety features, escape system technologies, and the New Shepard system work as expected. Blue Origin is preparing to launch space tourists and microgravity science on the New Shepard capsule. Named in honor of the first American in space, Alan Shepard, New Shepard will carry six astronauts at a time to an altitude beyond 100 kilometers, the internationally-recognized boundary of space. Blue Origin astronauts will experience the thrill of launching atop a rocket, the freedom of weightlessness, and views through the largest windows to ever fly in space. An animation of the Blue Origin astronaut experience can be found at www.blueorigin.com/astronaut-experience. Astronaut flights will likely begin in 2018, following successful completion of the flight test program. Blue Origin also envisions using New Shepard as a test platform for microgravity experiments. With three minutes of microgravity, and an expected high launch pace, the New Shepard will be able to launch science missions at a fraction of the cost and with greater access than orbital missions.